wasm-pack is a tool for assembling and packaging Rust crates that target WebAssembly. These packages can be published to the npm Registry and used alongside other packages. 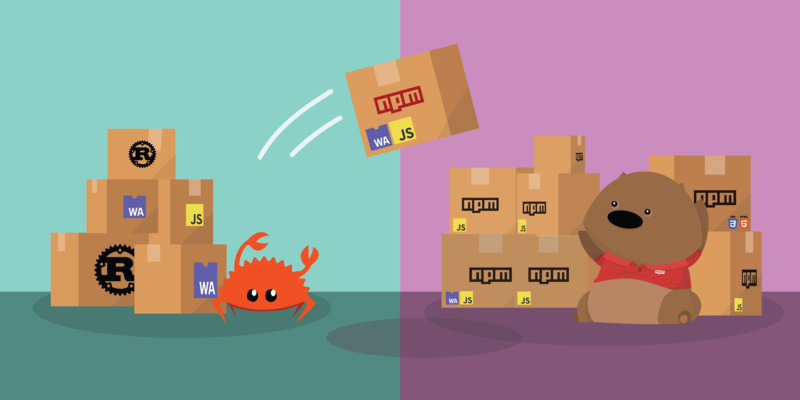 This means you can use them side-by-side with JS and other packages, and in many kind of applications, be it a Node.js server side app, a client-side application bundled by Webpack, or any other sort of application that uses npm dependencies. You can find wasm-pack on crates.io and GitHub. wasm-pack will add the appropriate WebAssembly compilation target using rustup and will compile your Rust to Web Assembly in release mode. wasm-pack wraps the CLI portion of the wasm-bindgen tool and runs it for you! This does things like wrapping your WebAssembly module in JS wrappers which make it easier for people to interact with your module. wasm-bindgen supports both ES6 modules and CommonJS and you can use wasm-pack to produce either type of package! wasm-pack will copy your Rust project’s README.md to the npm package it produces. We’ve got a lot of great ideas about extending this further to support the Rust ecosystem’s documentation feature, rustdoc– more on the in the next section! 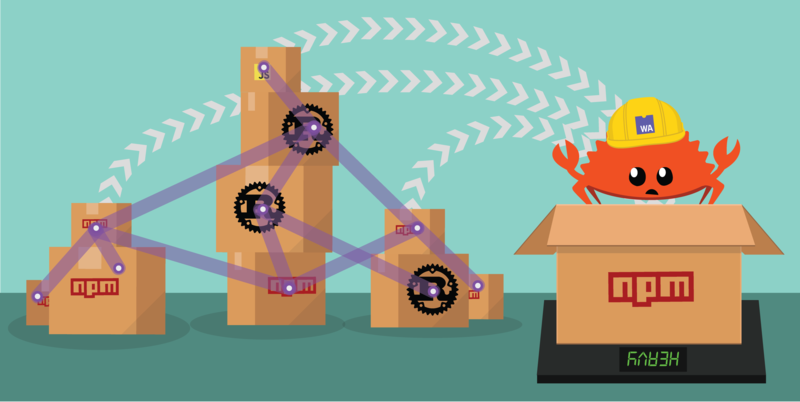 The crates.io team surveyed developers, and learned that good documentation was the number one feature that developers looked for when evaluating the use of crate. Contributor Yoshua Wuyts introduced the brilliant idea of generating further README.md content by integrating wasm-pack with the Rust API documentation tool, rustdoc. The Rust-wasm team is committed to making Rust a first class way to write WebAssembly. Offering documentation for Rust-generated WebAssembly packages that’s both easy to write and easy to discover aligns neatly with our goals. Read more about the team’s thoughts in this issue and join in the discussion! The preliminary work for this feature has already landed in wasm-bindgen, so the next step will be integrating it into wasm-pack. The naive integration won’t be too tricky- but we’re excited to explore the opportunities we have to streamline and optimize Rust dependency trees that contain npm dependencies on several levels! This work will be similar to the optimizations that bundlers like webpack deliver, but on the level of Rust dependencies. There’s a lot of questions we still have to answer and there’s going be a lot of neat engineering work to do. In a few weeks there will be a full post on this topic, so keep an eye out! We’re always communicating with the npm CLI team members Kat Marchan and Rebecca Turner, as well as the folks who work on webpack and Parcel– we’re excited to keep working with them to make it easy for developers to release and use WebAssembly code! The key to all excellent developer tooling is a short feedback cycle between developers of the tool and developers using the tool in their day to day workflows. 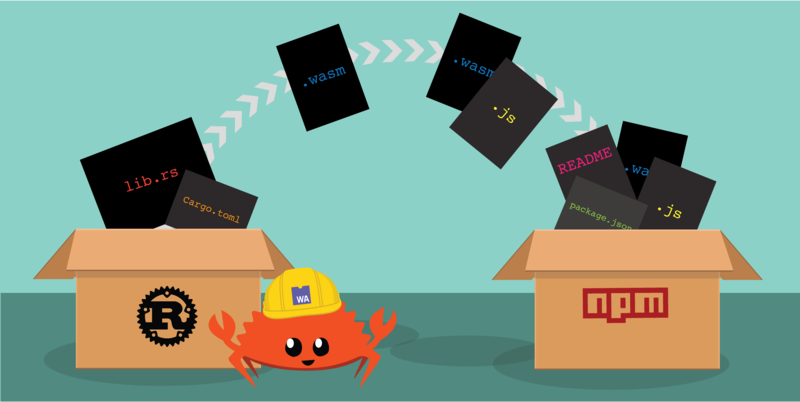 In order to be successful with wasm-pack, and all of our WebAssembly developer tooling, we need developers of all skill levels and backgrounds to get involved! Take a look at our Contributor Guidelines and our Issue Tracker (we regularly label things as “good first issue” and provide mentors and mentoring instructions! )- we’re excited to work with you!